Here are our featured post from last week! If your post was picked, don’t forget to grab a featured button for your sidebar! And now for the link up! Please add your link below. 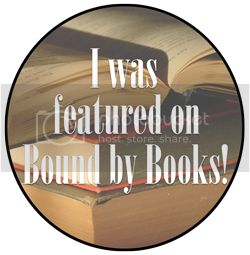 And feel free to visit the other lovely hosts of Bound by Books! I love reading! Thanks for the chance to win! I love that upcycled artwork! Gorgeous, and right up my alley!